As bloggers we’re all guilty of it. We see some really cool gadget over the internet, or we’re sent a random press release on what’s described as the next, greatest widget to hit since the invention of the cell phone. Usually we spot some fancy press release picture along with it which only serves to further peak our interest. So what do we do? We post about it. Sometimes we even offer our opinion on how “cool” the thing looks. Or the fact that we’d love to have one. But guess what? We’ve never even held it once, never tested it, don’t really know a darn thing about it. I was recently sent a Rad Blaster for review and guess what? $60 is actually an awful deal. I’m sure the RadBlaster article on Gizmodo generated a good amount of traffic on the Rad Blaster web site and probably a decent amount of orders too. All because they in some way hinted that they liked it. But here’s the problem. They never reviewed it. They never even saw it. They came to the conclusion that it looked good from one press photograph and some text they’d read! Heck, we posted about the Rad Blaster too, but did question the $60 price tag. 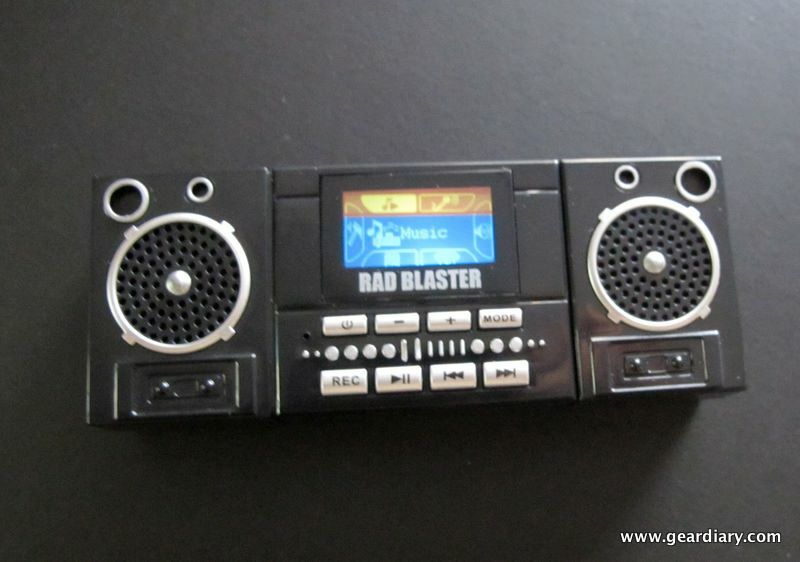 So let’s get to my actual hands on experience with the Rad Blaster. The concept of the Rad Blaster makes a lot of sense. It’s a cute little MP3 player in the shape of a Boom-Box. 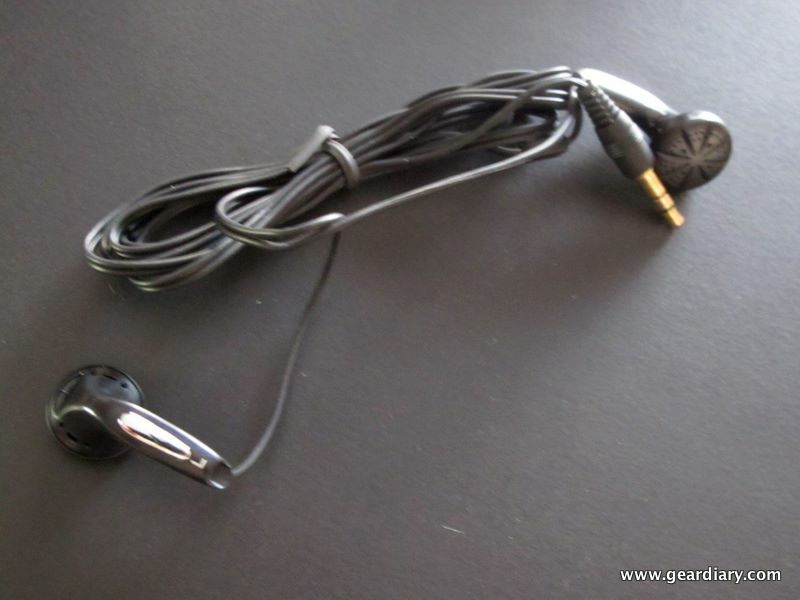 When you’re not listening to your music through the headphones, you’re able to “blast” it through the speakers and let the whole world hear it as well. My first thought upon opening the package was wow, $60 really? The Rad Blaster reminds me of something I might stumble across during a visit to my local Five Below store. It also made some sort of strange rattling noise inside. It felt as though a walnut was inside the mini Boom-Box and was rolling back and forth each time I titled the device from side to side. 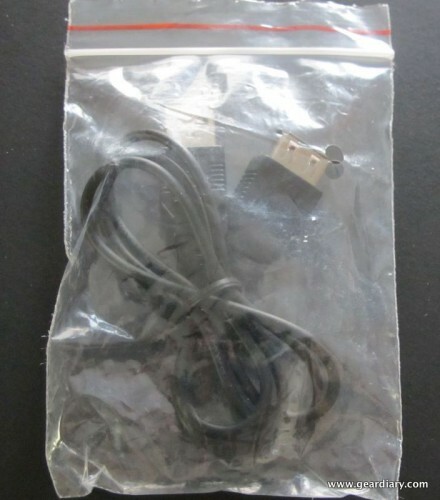 Inside the package you’ll find an inexpensive pair of ear buds. That’s not really too much of a disappointment. Most of us already own decent quality headphones and we’d probably chuck the ones included in favor of a better pair anyway. There’s also a USB cable which you’re meant to use to both charge the Rad Blaster as well as transfer you music to it via a free USB port on your computer. 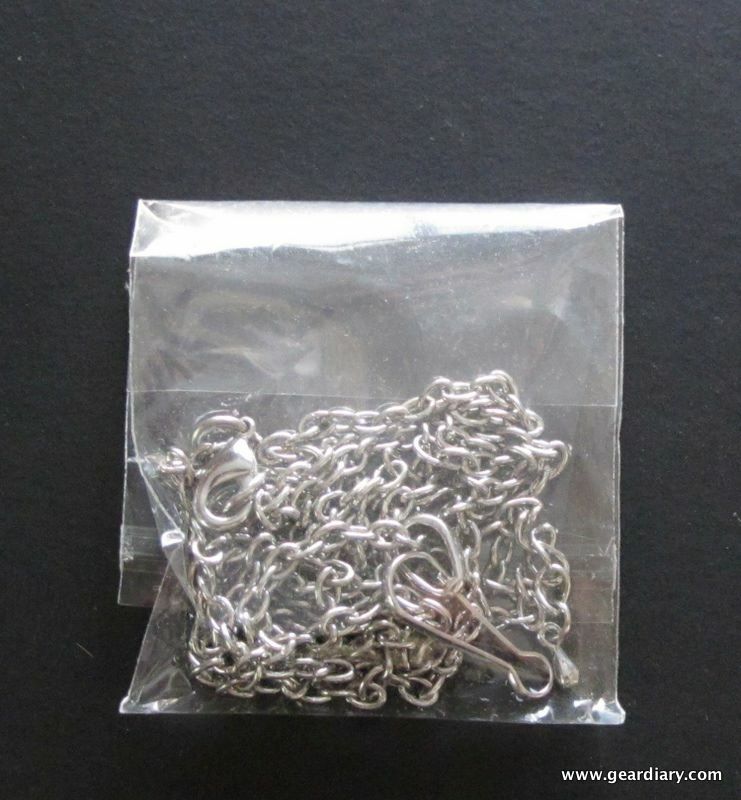 They even include a chain so, if the moment strikes you, you can wear your Rad Blaster around your neck. As if! I know I’m getting old, but the text in the instruction manual was so small I actually had to strain my eyes to read it. But after doing so I did manage to get things going. I fully recharged the Rad Blaster via my computer’s USB port and then set out to begin to transfer some music to it. And that’s where I ran into a road block. And a deal-breaker of a road block it was. The Rad Blaster simply refused to mount itself on my Mac Book Pro. I doubled checked the manual and sure enough it said the device was Mac compatible. Thinking perhaps it might be an issue with my Mac Book Pro, I plugged the Rad Blaster into my 24″ iMac. No dice again. Finally, in a last ditch effort I gave my Mac Book Air a go. Still nothing. 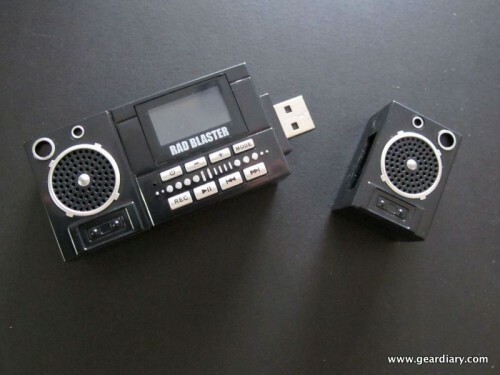 The Rad Blaster’s small LCD screen showed it was connected to my computer, but it never mounted. Frustrated I powered on the Rad Blaster to see if I could at least play with some of its features without being able to hear music. The 1″ “true-color” LCD screen reminds me of screens you find on those key-chain style video games. It was then I discovered there was already some music loaded on the device. Alright, it was only one song but I found it strange. Now to be fair, this is a review unit, and was sent to me via a third party. I’m not sure if they used it first or not, but the unit seemed fairly pristine in its retail packaging when I received it. Now you can roll in style. Whether you are off to a Red Carpet event, making a presentation at work, or chilling in school the Rad Blaster is your perfect accessory. 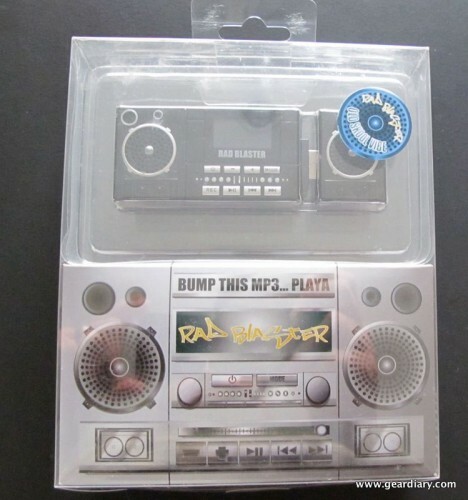 Bump the hottest tunes or store all of your important files in this one of a kind throwback to the days when Parents just didn’t understand. Sounds almost rebel-like doesn’t it? Well guess what music came pre-loaded on my Rad Blaster? Wow, what kind of crazy teenage rebel gets caught blasting Lionel Ritchie. I think my parents would have actually understood that just fine. They would have probably been thrilled. I reached out to Rad Blaster with my concerns and issues via the contact form on their web site. They do not provide an e-mail address and the actual site doesn’t even have any contact information on it. The only way to find the contact form is to actually click the “buy now” link on the site. After 24 hours without a response, I filled out the contact form again wanting to make sure that they’d received my inquiry. I have still not heard back. So what’s the bottom line? You know the old saying “buyer beware.” It applies to tech. blogs too. Just because some web site says a device looks cool doesn’t mean you should run right out and buy it. Real, hands on reviews are a must when making a purchase decision based off something you see online. The Rad Blaster was nothing short of a FAIL for me. Not being able to transfer music to a Mp3 player pretty much defines the word FAIL. All that aside, here’s hoping I simply received a faulty unit. Since I haven’t heard anything back from the company I can’t say for sure. 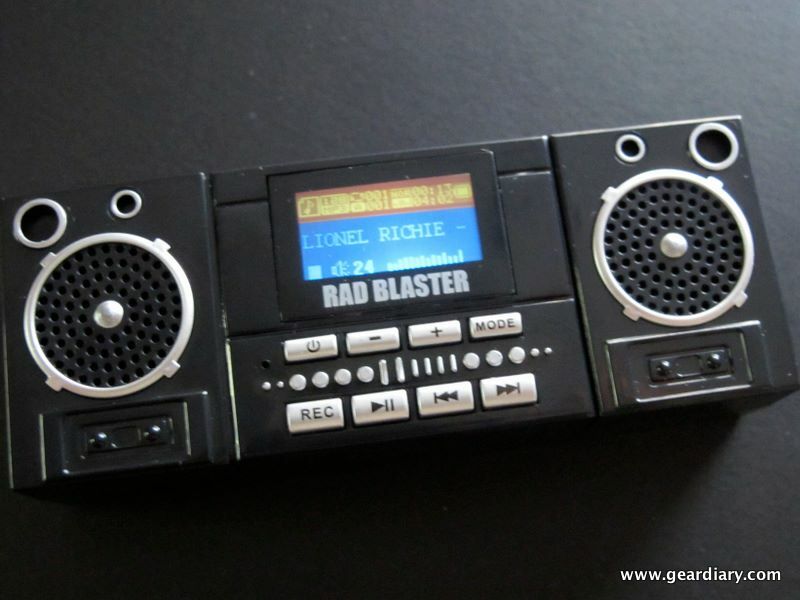 You can learn more about the Rad Blaster by visiting their web site here. What I like – I like the concept. What I don’t like – Unable to mount with Mac; Poor quality for both device and accessories; Non-responsive customer service. I have always had a passion for gear and gadgets. It all started for me with the release of the very first Palm Pilot. I've always had an interest in handheld electronics. From handheld PDAs, to cell phones, Mp3 players, watches and other products, I'm the first person my friends, family and colleagues call when they need advice on tech. I have roots in the online tech. forum community. I served as the Administrator to Howard Forums.com and as a Moderator at both Treo Central.com and Blackberry Forums.net. Under the screen name “lgreenberg” I've amassed 50,000+ postings. I also manage my own YouTube channel under the user name larrygreenberg. I'm always eager to help.